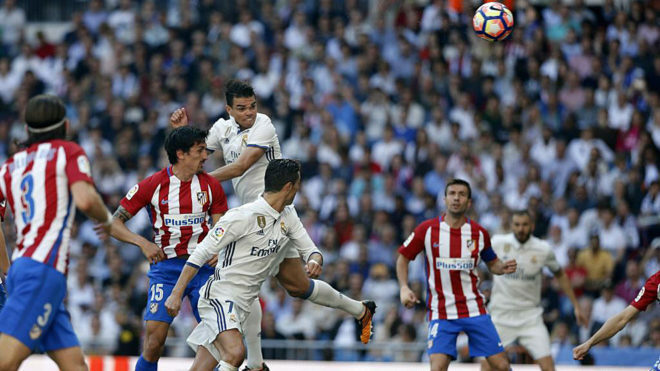 A towering header from Pepe on Saturday afternoon sent Real Madrid another step closer to making it a whole year’s worth of scoring in every game, although Bayern Munich represent arguably their toughest challenge yet. Bagging at least one goal for the 52nd game in a row against Atletico Madrid, Los Merengues have now netted in each game since a 1-0 win over Real Sociedad on April 30, 2016, with Manchester City the last to deny Zinedine Zidane’s side in last season’s Champions League semi-final first leg. It’s once again in European competition where Real find themselves on Wednesday, travelling to Bayern’s Allianz Arena to face Germany’s best football team in the first of a double-header. Only failing to score on one of their 11 trips to face Die Roten, Madrid have a full attacking complement this time around whilst Carlo Ancelotti is without key centre-back Mats Hummels. It’s true that Gareth Bale & Co. are hardly living their greatest form going into the tie, but there are plenty of alternatives in James Rodriguez, Alvaro Morata, Isco, and Marco Asensio to keep the home team guessing. Making it 53 straight games of hitting the back of the net is a lucrative outcome for Real, chiefly because they know a juicy away goal or two represents the best way for them to secure passage to the semi-finals. If they can score in Munich and reach the final four, Los Blancos will feel that no one can stop them in their goal of becoming the first team in the modern Champions League era to successfully defend their crown.